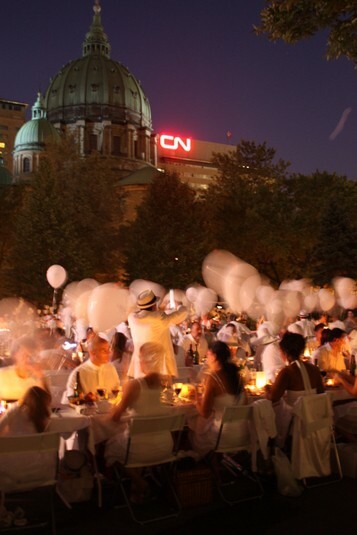 Last Thursday was Montreal’s third Dîner en blanc (Dinner in White), and it was the first time I had attended this impressive event. A couple of months ago, friends from Montreal invited E and me to take part in Le Dîner, and we accepted quickly, thinking it looked fun and a great excuse to dress up. 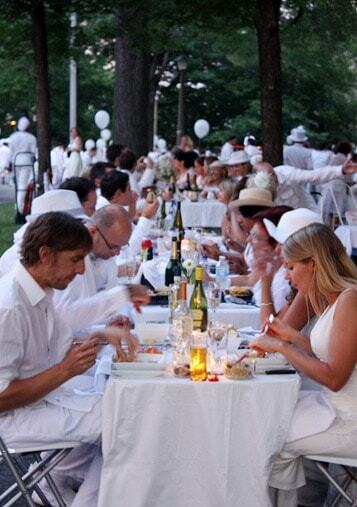 A tradition started about 20 years ago in Paris, it’s a huge outdoor picnic held in a public (and picturesque) place in the city where thousands of people, dressed in white from head to toe, gather to eat, drink and be merry. 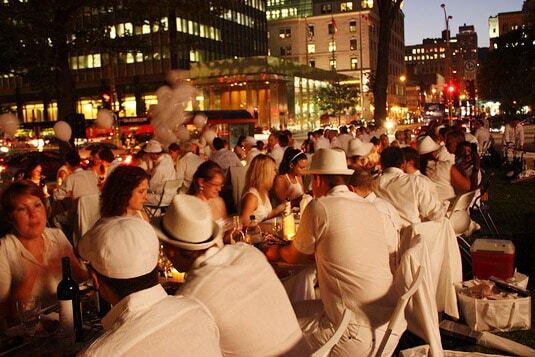 Every year, the exact location of the event is kept secret until the very last minute, and the responsibility of gathering everyone at the same spot in an orderly manner falls into the hands of a hundred volunteers who have been trained and kept in the loop by the Dîner’s management. Sounds fun? It really is, but it demands quite a bit of planning before the big night. First, you have to decide on what you’re going to wear – white from head to toe may sound easy, but the attire must be very elegant (ties, high heels and hats are strongly recommended). 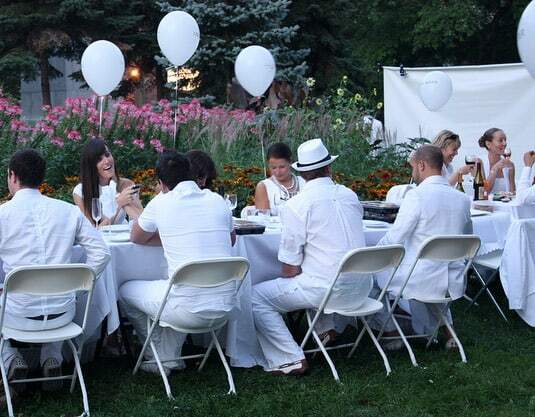 Then, everyone must bring their own chair (which must also be white) and 30″ × 30″ table (with a white tablecloth). 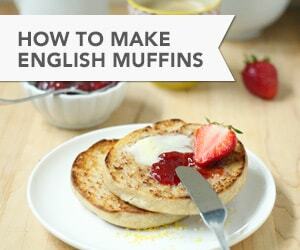 Finally, you must prepare your own (fancy) picnic, which you’ll bring in a white basket (or cooler). 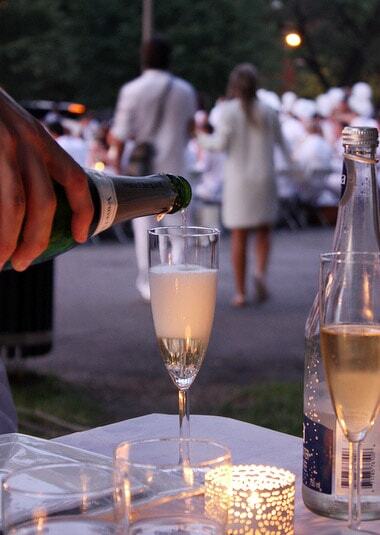 And don’t forget your white votive candles and flowers, white tableware, champagne and wine glasses (no plastic allowed). Sounds complicated? 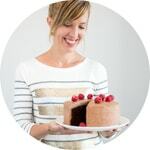 It is, somewhat, but, like all surprise parties, there’s just as much fun in the planning process as in the event itself. We found inexpensive folding white chairs at Ikea, and managed to rent the table and tablecloth, and we had everything else at home. We split the picnic preparation between ourselves and our friends, so we packed everything in the car and drove to Montreal. About an hour and a half before the picnic starts, 50-person groups gather at different spots across the city, either at metro stations or bus stops. Each group is led by one volunteer, who must make sure everyone on the list is there (absentees may be banned from attending future Dîners) and that everyone’s attire and equipment fits the requirements. Then, all groups ride or walk to the chosen location. You know you’re in the right place when you see hordes of people dressed in white, awkwardly carrying cumbersome equipment! Then it’s setting up time. 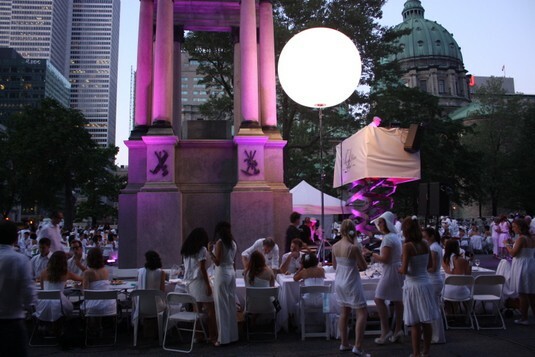 Imagine over 3,000 people unfolding their table and chairs and unpacking their dinners at the same time! 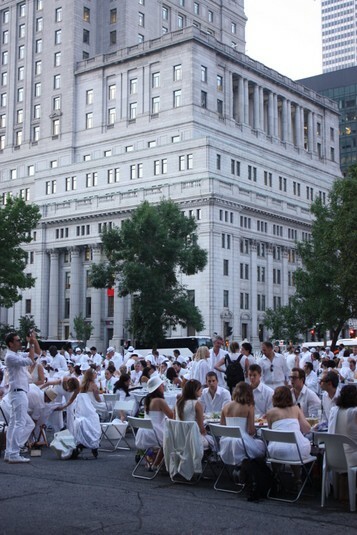 It was done surprisingly smoothly at Montreal’s Place du Canada, the location chosen for this year’s Dîner. 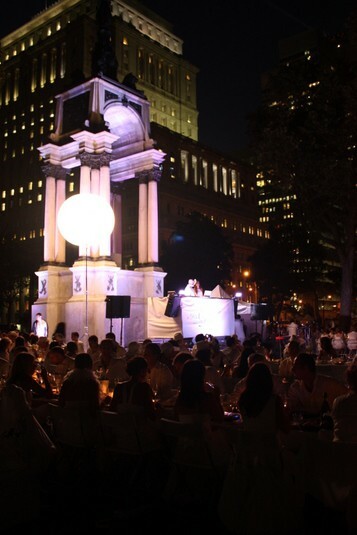 In under an hour, everyone was seated, the DJ had started playing and champagne bottles had started popping. We cheered together at what looked like the biggest and greatest wedding ever. The four of us had brought way too much food; through all the action, people-watching and picture taking, we only got through our first three courses before it was time to get up and dance. 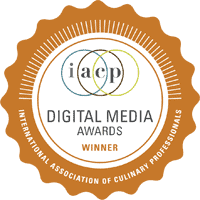 We decided to keep the foie gras, cheeses, dessert and chocolates for later and focused on having fun. The dance lasted about an hour before it was time, at around 11PM, to gather our things, fold everything back up, pick up our trash and leave the park exactly as it was before everyone arrived: the Dîner organization’s reputation for leaving things tidy allows them to keep on getting permission from the city’s management, year after year, to invade the most beautiful parks and places around town. 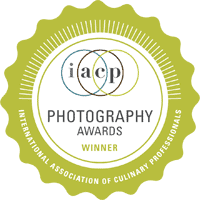 It was a beautiful night; a photographer’s paradise. We left the park, went back to our hotel to have dessert and chocolates and then left again for the after-party, which took place in a beautiful bar in the Old Port. 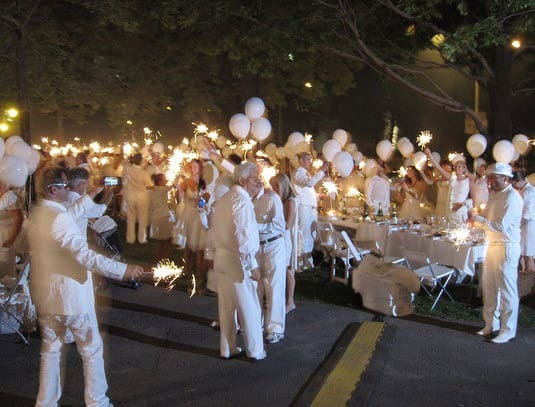 The premise of dressing in white “just because” may sound a bit pointless, but when you see it and you’re part of it, you discover there’s something truly magical about it. 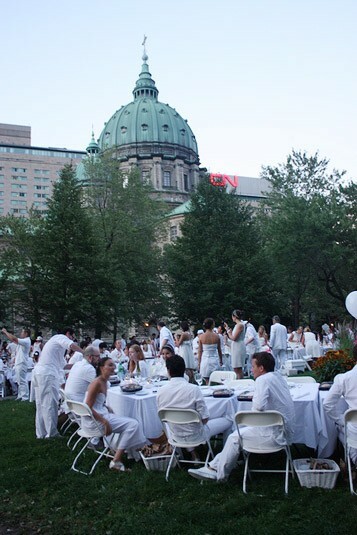 Ironically, this year was the first year when a Dîner en blanc was also happening in Quebec City, on the same night as Montreal’s. It looks like it’s been a great success in our home town as well, so we’ll probably be part of next year’s event. When you’ve gone through the planning process once, it seems much less daunting for the years to come! Next week, it’s New York’s turn, on August 25th. Because nothing’s ever ordinary in the Big Apple, I can’t wait to hear, see and read more about it! 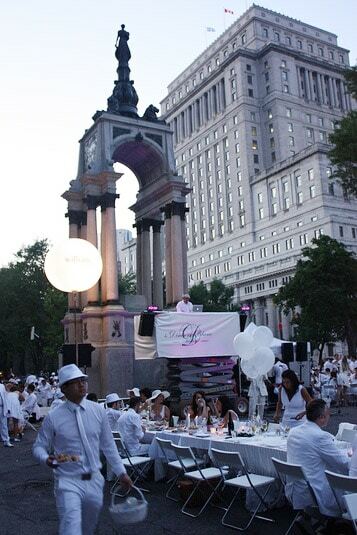 I’ve read so much about the Paris version, I loved seeing Montréal’s event. Gorgeous and ethereal. Thank you for sharing your photos! 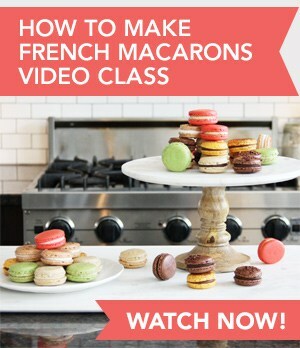 Ann, I’m happy you stopped by, I’m a big fan of your blog and I loved your first book. There definitely was a magical feel to the night, which feels like a dream now that a few weeks have passed! How cool! 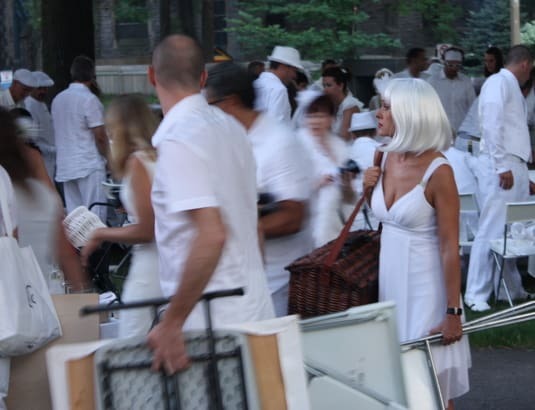 We have one of those all white events in New Orleans (called White Linen Night), except that it’s an art event where galleries stay open late. beautiful, eccentric idea. I have heard of this but never have gotten the opportunity to attend. Maybe they will do one in Philadelphia. It sure looks like it’s getting more and more popular on this side of the pond with one in New York this year. Keep your fingers crossed for Philly! I just came back from New England, we had a wonderful trip and I’ll be writing about it very soon. I loved it so much that I’ll go back soon enough, I’ll keep your reference close! Thanks for sharing it. I’m happy the Dîner allowed you to stumble upon my blog and I hope you’ll come back often! Bravo Montreal! It looks as magical as Paris was. 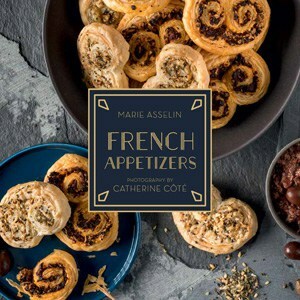 I wish I had been to one of Paris’ dîners! It’s such a magical city to start with, an event like this in Paris must feel surreal. 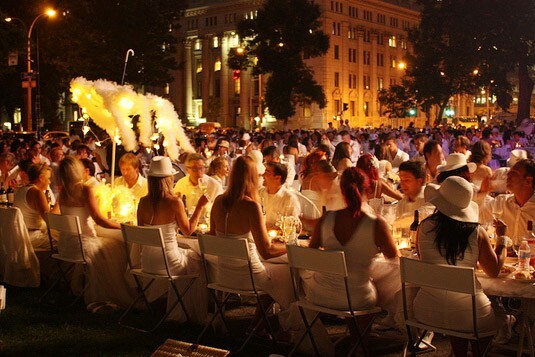 Subscribe to the different Dîner en blanc sites to be in the know because invitations are not easy to get!